The science behind learning is complex, but understanding how students learn is the first step toward developing more effective teaching processes. Today, psychology professor Art Glenberg shares his insights on the learning process, and particularly on reading comprehension. Glenberg teaches at the Arizona State University Learning Sciences Institute, where his Laboratory for Embodied Cognition is making great strides in uncovering critical information about how the human mind operates and how children learn. His work on embodied cognition has appeared in Scientific American and in the Brain Science Podcast series. Enjoy today’s Daily Edventure with Art Glenberg. I am a cognitive psychologist who studies learning and language comprehension and their application to the teaching of reading comprehension. Over the past 15 years, the area of embodied cognition has developed within the broader field of cognitive psychology. According to the precepts of embodiment, the human mind does not work like a computer (the dominant metaphor in cognitive psychology). Instead, human cognition is the result of evolution and reflects the needs of the acting organism. Thus, our thoughts are shaped by bodily morphology and abilities. For example, we think about ordinary objects like a cup in terms of how we can hold it (note that we need hands and fingers of a particular type to do this: a dog can’t hold a cup), lift it, and drink from it, not as a member of an abstract category of containers. Similarly, we think about distance in terms of how much energy it takes to traverse that distance so that things literally look farther away when we are tired. I believe that developing a better understanding of human cognition offers one of the best ways of innovating in education. An example of the sort of educational innovation consistent with the principles of embodied cognition is the reading intervention, Moved by Reading. It is designed to help children get the meaning of text (not just to pronounce the words) by showing the child how to map the words and syntax of the text onto his own embodied experiences. With Moved by Reading, the child reads a text that is accompanied by pictures depicting objects relevant to the text. For example, in reading stories about a farm, the pictures include a farmer, barn, tractor, animals, etc. 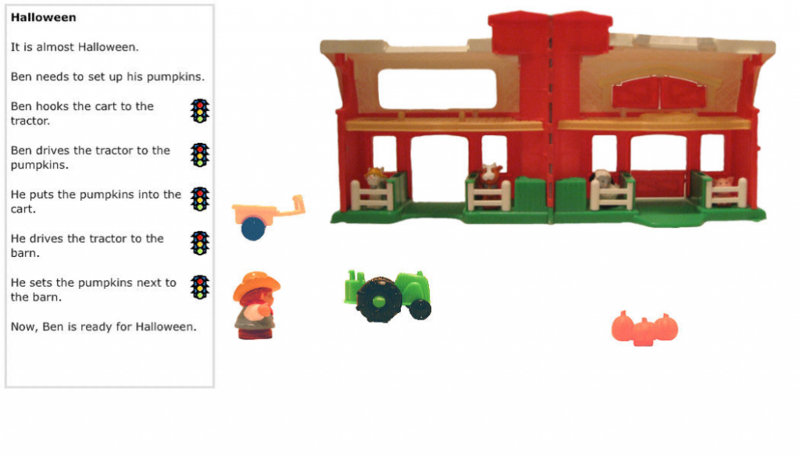 Then, after reading a sentence such as “The farmer drives the tractor to the barn,” the child literally simulates the meaning of the sentence by moving (using a computer mouse) the picture of the farmer to tractor, and then moving the tractor to the barn. Thus, the child maps the word “farmer” to the concrete image. Additionally, the child maps the syntax of the sentence, the “who does what to whom,” to his own actions in moving the pictures on the computer monitor. Following training of this sort, the child is asked to imagine moving the pictures rather than literally moving them. My research shows that both the literal manipulation and the imagined manipulation produce tremendous increments in reading comprehension compared to simply reading the text. This entry was posted in People, Personalized Learning, Researcher and tagged Arizona State University Learning Sciences Institute, human cognition, Laboratory for Embodied Cognition, Moved by Reading. Bookmark the permalink.